Review by AllTheBestFights.com: 2015-06-26, disappointing fight between Cheick Kongo and Alexander Volkov: it gets two stars. The black belt in karate and kendo Cheick Kongo entered this fight with a professional mma record of 22-10-2 (73% finishing rate) and he is ranked as the No.21 heavyweight in the world while his opponent, the former Bellator Hw champion Alexander Volkov, has an official record of 24-5-0 (79% finishing rate) and he entered as the No.19 in the same weight class. Both fighters have lost their last bout ia split decision: the 40-year-old Kongo (14 years older than Volkov) was defeated by Muhammed ‘King Mo’ Lawal (=Lawal vs Kongo) while Volkov lost to Tony Johnson (=Volkov vs Johnson). 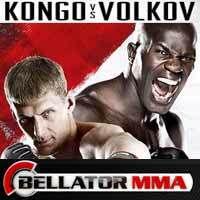 Kongo vs Volkov is the main event of Bellator 139. Watch the video and rate this fight!